I know for a fact that Google Buzz and Google Wave are two different services. But we can’t discount the fact that their functions are almost similar. 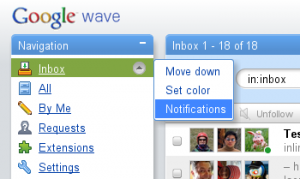 So let me ask you this question, since Google Buzz was released, are you still using Google Wave? If yes, then you’d be glad to know that Google has just activated email notification for Google Wave. Google Wave’s notification works just like all the other Google notification systems – Buzz, Email Alerts for specific search results and others. It sends you email alerts whenever a wave that you are participating in gets an update or whenever a new Wave has been created by your Google Wave contacts. The notification contains a short summary of text and links that will lead you straight to the updated waves. Once you’ve checked out a wave, Google will stop sending the notifications related to that wave. The feature also lets you select the frequency of email updates that will be sent to you. It could be as often as “immediately,” and you can select which of your friends you will like to receive notifications from, whenever they create a new wave or update an existing one. Now, should you decide to use this feature, expect to encounter the following known issues so far, which Google is currently resolving. But don’t let this stop you from trying out the new Google Wave notification feature.